This is a PSA: Eye exams are not only for updating your prescription. Get an exam by an ophthalmologist each year to save your sight and sanity. End PSA. Many of you know that Ric recently had a torn retina and consequently our long-planned trip to the U.S. was cancelled. For those to whom this is news, read on for our status and latest encounter with the Italian medical system. We were supposed to fly to the U.S. on October 11. Planning to buy new eyeglasses while there (costono un occhio della testa* in Rome), we made an appointment for a week before the trip with the doctor we have seen before. His office is a marvel of apparatuses for examination and treatment, and as with so many situations here the doctor does all the tests himself. There is no nurse nor technician in the practice: only two doctors, and a receptionist who sits at a small desk with a phone and an appointment book. She is a model of efficiency in this thriving practice. It seems like barely controlled chaos, yet everything functions smoothly. 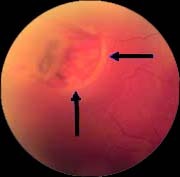 Not Ric’s actual retina, but very similar to pictures taken by his doctor. Fascinating! My exam went swimmingly and then it was Ric’s turn. The doctor made dissatisfied noises as he reexamined Ric’s dilated left eye. There is a problem and it must be fixed here tonight: The retina has a tear. The good news was that he could do a laser treatment to cure it, and three hours after we arrived for routine exams we were out the door with a completed procedure. No making an appointment for the next day, no delays; it was immediately accomplished at a very reasonable price. The bad news was that we were unlikely to be able to travel and Ric was placed under house-arrest pending a recheck in 4 days. He could not read, use a computer, do housework, or even take a walk or go out to eat. All he could do was watch TV. He could not even carry his own backpack out of the office, so I became the packhorse. I am sure I looked very elegant in my pretty blue dress and heels walking down the street carrying my daypack as well as Ric’s. The doctor even said “I am sorry for you, because you will have to do everything.” And so Ric watched TV and I did everything else. Watching TV all day seems like fun until you are told it is all you can do. Luckily we have a huge movie database, thanks to our movie-collector son who set us up when we left the U.S. Ric found movies he never knew existed including some that should remain buried and forgotten. We also have Netflix streaming, and supplemented that with PBS and CBS streaming. But still…he was very bored. Not being able to go for walks was a killer. Like any prisoner, he looked forward to meals. And for the second time in 30 years together, I had to do the daily cleaning of the cat litter boxes. Che una tragedia! Tuesday we returned to the doctor full of hope that all was well and we could go the U.S., see our friends in Portland, visit my brother in Colorado, and then attend our nephew’s wedding in New Jersey. But the healing was not sufficient and the doctor wanted to see Ric again in a week as he possibly needed another procedure. Cancelling a trip so long-planned is arduous and depressing, an emotional roller-coaster. However, we comforted ourselves that Ric’s eye problem was caught and remedied. We have since heard stories similar to his, and also tales of horror, such as people who had detached retinas who spent 3 months lying on their stomachs to heal, able to get up only for necessary bodily functions, otherwise entertained only aurally. If that happened, one of us would have to be put in a medically induced coma. So we carry on, grateful for good care, each other, and the long-distance supportive comments we received from so many dear people. My office was very understanding and I was able to take time to support Ric. We will escape to one of our favorite places in Italy for a few days next week as a consolation prize and work on plans for a trip to the States in 2015. At least the doctors in Rome are excellent. One of our daughters had to have surgery there many years ago and the care was fantastic, plus reasonable. So sorry that you missed your trip back to Oregon. We managed to get away the same day that you were supposed to leave and arrived in California safely, if tired. I hope that your husband’ eye is soon healed. Thank you Chloe. We are very happy with the medical care here. Very personal, doctor/patient time is significant and not rushed. So glad the problem was caught so quickly! How amazing that the procedure was done immediately! I am going in for a knee replacement next Tuesday. It has taken three months to schedule. Mostly due to me and then the doctor’s schedule. I managed to catch pneumonia, in order to cancel the first surgery! If my doctor had known what a problem I’d be he probably would have taken me into the back room and done it right then! 😉 Hope Ric is back to great health and allowed to move again. Torture for me would be named “nothing but TV!” As always, I love hearing your delightful renditions of Life! Dear Terah, so sorry to hear about your upcoming surgery! You are too young for such a thing! Make LB take you to Italy as a reward when you have recovered. Hugs and best wishes for a speedy recovery!